Presenting The Cage #2 The Hunt by Megan Shepherd. They may be out of the enclosure but Cora, Lucky and the misfits are still a long way from escaping the station and finding their way back home. 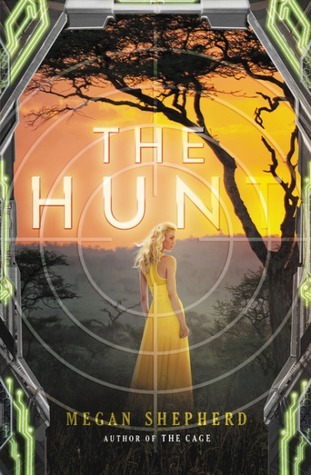 The Hunt by Megan Shepherd follows closely behind the first book 'The Cage'. Beginning just where the first book ended. The group has now been scattered across the station in different areas as punishment for their destroying the previous enclosure. And somehow I still got bored. Although I liked Cora a bit better this time. She is resourceful, quick on her feet and knows when to grasp the opportunity coming her way. Cassian still felt weird to me .... I definitely liked Lucky a lot better this time as well. In the first book, he caves under pressure and thinks the aliens are right with their rules but he stands taller this time. Makes decisions by himself. Definitely good. Leon, Nok and Rolf too try to rebel against the aliens in their own ways. They all may have been separated throughout the station but are more than capricious and lucky enough to find ways and keep in contact. The book is paced really well and liked how the author explores newer aspects for all of her characters. The twists & turns were really well positioned throughout the story .... particularly the ending cliffhanger .... Yup there is a cliffy! But somehow I still got bored with the story. Just feel that the first book was much better in my opinion. "A well written sequel packaged with the necessary elements to take the story to farther reaches of space"